The president is growing more erratic and dangerous by the day. Donald Trump’s sometimes subtle and often bellicose threats against Iran are on the upswing. He foments hostility at home, using civil war dog whistles that rile militia groups and rogue agents, while forecasting mob “violence” if the Republicans lose the House. Trump doubles down in his embrace of tyrants who actively spurn the free press, before creating his own fake news about hazards at the border. He secretly prepares for the potential of a new attorney general, complete with a Mueller-proof ethics-waiver, while capriciously flirting between firing or pushing AG Jeff Sessions to resign. We discussed this type of psychological unraveling in our NBC Think op-ed regarding the 25th Amendment, predicting that the president’s deterioration would hasten in response to the advancing Mueller probe. While neither of us know the president, we can confidently assert that people like Trump, with well-documented and long-standing behavior patterns consistent with narcissistic and anti-social personality disorders, are prone to becoming more paranoid, unpredictable, impulsive and dangerous when they are under extreme levels of distress. But another danger, lurking beneath the Donald Trump horror show, is the Republican-led Congress and its failure to place appropriate checks on our nation’s executive branch. Even if the Cabinet did its job and invoked the 25th Amendment, the current Republican members of Congress would not lend their required support to relieve the president from his duties under this nation-saving measure. In addition, the GOP-led House will not impeach the president, and the Republicans in the Senate would not convict an impeached president. Is it simply the Republican agenda that keeps Congress in lockstep with Donald Trump? Certainly, this most commonly cited interpretation of their behavior is one possibility. Could it also be that the GOP-led members of Congress are afraid of Trump’s power? The president’s deranged rants and uncanny ability to whip his base into a hypnotic frenzy of hatred towards Trump’s political enemies may also contribute to their hamstrung performance. The religious right’s war-oriented, authoritarian agenda, detailed in our chapter in Rocket Man, also provides some insight into GOP compliance with Trump. But while the Republicans’ autocratic values, fear of Trump’s sway, and prominent desire to enact their policy vision may be contributing to their duty-shirking behavior, we believe there is more to the story. In this piece, we logically explore many of the available data points that surround selected members in Congress and their passive, servile response to Trump’s irrational and dangerous behavior. Rather than looking at each action or inaction as an independent event, we string them together as a collective whole, in search of an organizing principle that unites the sum of these Congressional missteps. Drawing upon political and psychological insights, as well as Occam’s razor — the reasoning principle used by scientists and academics that states that the most obvious explanation is usually the correct one — we lay out an evidence-based case that many behaviors executed by key GOP Congress members are unreasonable, from a Republican and conservative point of view, possibly indicative of deeper, non-policy-oriented entanglements. The first clue that the Republican members of Congress are behaving irrationally and counter to their conservative values relates to the GOP leaders’ refusal to impeach the president, even though Vice President Pence would be Trump’s inevitable successor. On the surface, ushering in a President Pence would appear to be both a brilliant and logical move for the Republicans. If Pence were president, Congressional Republicans, many of whom strongly opposed Trump in the GOP primaries, could accomplish just as much of their policy agenda, if not more, with a lot less collateral damage. Congress’s failure to create this change suggests that something outside the realm of normal politics cements Republican leaders to Donald Trump. The knowledge that Robert Mueller’s investigative “walls” are closing in on Trump, his family, and his inner circle should embolden GOP leaders to avoid any association with Trump. Therefore, we would expect rational Republican House and Senate members to steer clear of any interference with the Russia investigation, given the strong evidence that Trump, and many in his orbit, are compromised by Russia and that some have also committed crimes. But this reasonable expectation is far from the reality of what is happening. We begin our exploration by looking at the irrational behavior exhibited by House Intelligence Committee (HIC) Chairman Devin Nunes, in relationship to the president and the HIC probe into Russian election interference. Nunes’s fellow HIC cohort, Representative Adam Schiff, has referred to Nunes’s conduct as “deeply disturbing” and “deliberately misleading.” While his colleagues stop short of saying he is colluding with Russia, Rep. Eric Swalwell asserts that Nunes has been compromised by the White House, asserting that Nunes “buried key evidence on Russian meddling to protect Trump.” There is no logical reason for Nunes to go so far in trying to obstruct the Russian investigation unless he has something personal at stake. Why else would Nunes use up his own political capital to attack the Mueller investigation and interfere with the House’s investigation of Russian interference in the election? Such conduct invites Democratic donors nationwide into opposing Nunes’s bid for re-election, not to mention making him a target of future investigations if the Democrats gain control of the House. Graham’s striking U-turn took place later in 2017, when he suddenly became one of the president’s staunchest allies and almost overnight. In October of 2017, Graham played golf with Trump for the first time — and twice in the same week. During their week of golf dates, the LA Times reports that “…other senators have said Trump and Graham now talk so frequently it’s as if they are on speed-dial with one another.” Based upon the timing of his dramatic shift and their golf games, we assume that the conversations Senator Graham had with Trump on the golf course played a role in his sharp reversal. Also noteworthy is Graham’s echoing of the president’s deceptive words. In August of 2018, The senator mirrored Trump’s “no collusion” fabrication on Fox & Friends, stating: “A lot of people try to convict President Trump. Don’t be so fast. I have seen no evidence of collusion after two years.” Graham has replicated Trump’s unsupported claims regarding the DOJ asserting: “Plenty of corruption at the DOJ and the FBI. Should be stunning” and has recommended investigations into these two agencies. Graham also attempted to cast doubt around the Steele dossier, mimicking Trump’s narrative that Putin was trying to help Hillary Clinton, rather than Donald Trump. Today Graham practically finishes Trump’s sentences for him, so keenly aligned with Donald Trump’s incongruous thought process. We know that Senator Graham’s emails were stolen by the Russians, based upon his own admission in a December of 2016 interview. Most of Graham’s hacked emails have not been released, so it is reasonable to consider the possibility that many of his emails are still in play, according to Authoritarian scholar, Sarah Kendzior; she observes, based upon Graham’s behavioral changes and purloined emails, that “there’s a pretty good chance that either voluntarily or involuntarily Senator Graham has gotten mixed up in the situation and cannot be an objective observer” when it comes to discussing Trump and his relationship to Russia. We contend that it is possible that the senator’s uncharacteristic twin-ship with the president could be rooted in fear or some other, non-policy motivation, rather than an organic or principled shift. House Speaker Paul Ryan, House Majority Leader (and close Trump ally) Kevin McCarthy, and House Majority Whip, Steve Scalise, are also on our list of Republican leaders exhibiting odd behavior in relationship to Trump and Russia. The Washington Post reports that just a month before Trump clinched the Republican nomination, McCarthy was caught on tape talking with a small group of Republican leaders, including Ryan, while making an explosive revelation: “There’s two people I think Putin pays: Rohrabacher and Trump.” Ryan quickly stepped in, warning his colleagues to keep this conversation secret: “This is an off the record… No leaks!” Ryan repeated his warning: “This is how we know we’re a real family here.” Steve Scalise added to the warning: “That’s how you know that we’re tight.” Ryan capped the conversation off with a Vegas-style call for secrecy asserting that “what’s said in the family stays in the family.” While we do not know the specifics of what these three men knew before the election, it is clear that they believed that Trump was being paid by Putin. At the very least, the GOP leaders in the House — Paul Ryan, Kevin McCarthy, and Steve Scalise — were enabling Putin’s meddling and Trump’s behavior of accepting money from a hostile foreign power. Why didn’t they immediately report specifics about whatever suspicions they had about Trump’s troubling financial arrangement with Russia to the FBI? Surely these Congressmen would have been recognized as party-saving heroes at that pre-nomination stage in the campaign process. 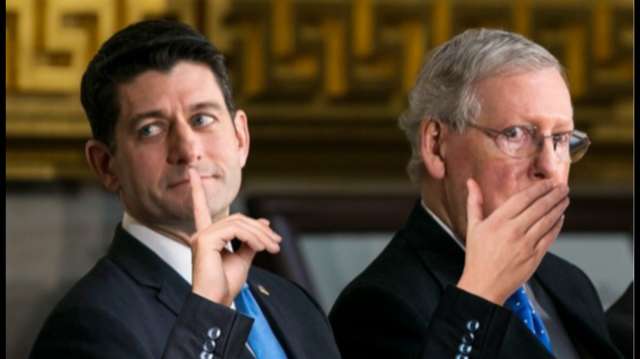 Was their silence simply the product of their desire to win at any cost in order to advance Republican policy goals? Or was their secrecy tied to other motivations? Multiple news sources reported in July of 2018 that Paul Ryan was instrumental in stalling and weakening the Russia sanctions bill supported at the time by many in Congress, including Republicans, doing a solid for Putin, rather than doling out the appropriate consequences and protecting the United States’ interests against an enemy combatant. This level of cooperation gives the impression that Ryan’s goals go beyond the GOP’s ideologic platform, and that he is supporting the Russians or Trump’s relationship with the Russians, for some other reason, in spite of the condemning trajectory of the Mueller probe. Speaker Ryan and House Republicans also ignored the House Democrats’ pleas for a full committee hearing on election security, completely disregarding the intelligence community’s repeated warnings that Russia is trying to interfere with our November 2018 mid-terms. Voting security experts tell the NYT that U.S. elections “are in grave danger,” thanks to our blindness to the risks posed by highly-hackable voting equipment. Andrew Appel, Princeton computer science professor and a voting security authority, has testified before Congress that all 9000+ voting jurisdictions in the United States are vulnerable to being hacked. And yet, the Republicans have denied states access to additional grants that would allow them to update their voting systems and intelligently combat remote access interference by using paper ballots and risk-limiting audits. (This approach is the voting security standard for reliable elections, according to U. C. Berkeley’s Philip Stark and MIT’s Ron Rivest, two of the world’s leading academic authorities on verified elections.) Once again, it is strange that Ryan, who is not even running for reelection in 2018, would not want to protect the integrity of future elections against Russian interference. If not for posterity’s sake, wouldn’t Ryan want to distance himself from Trump and Russia to preserve his own reputation, given the trend of the special counsel investigation? Since the 2016 election, Senate Leader Mitch McConnell has exhibited a host of disturbing behaviors in relationship to Trump and Russia that are at odds with reasonable conduct. Back in 2016, he blocked President Obama from announcing that Russia was meddling in the election, refusing to sign a bipartisan statement that would condemn Russia’s interference. McConnell also refused to pass a law protecting Robert Mueller’s investigation into Russia’s election meddling, which raises another red flag. Why wouldn’t McConnell want to ensure that the special counsel finishes its probe, given the direction of Mueller’s findings thus far? Does McConnell doubt the investigation and intelligence community’s findings? Does he not care about protecting the United States from potential enemy attacks if the attacks help the Republicans? Or is he resistant to the special counsel for his own private reasons? McConnell’s problematic finances provide insight into the possibility that a personal agenda, apart from the wish to see Republican policy success, could play a role in his irrational behavior. Experts maintain that Putin funneled millions of dollars through his oligarchs into the Republican Party during the 2015–2016 election cycle, according to Ruth May, a Russian economy expert and professor at the University of Dallas. May reports that between 2015 and 2017, McConnell’s super-PAC received a total of $3.5 million dollars from Len Blavatnik, a Russian-American oligarch with close ties to Putin and the Kremlin. (Blavatnik came to the U.S. in the late ‘70s, gained his citizenship, and returned to a crumbling USSR in the 1980s.) Blavatnik also gave millions in donations to Lindsey Graham and Marco Rubio’s PACS. Because of Blavatnik’s citizenship, these donations may have the surface appearance of being legal, but according to ABC News, the Mueller team is investigating the “the timing of contributions coming from US citizens with ties to Russia.” Ilya Zaslavskiy, an Oxford-trained scholar and oligarch expert, asserts that Mueller will find “overwhelming evidence that Putin has run a multilayered, sophisticated campaign against American institutes,” once he finishes investigating the Kremlin-linked oligarchs’ donations to Trump and the U.S. Congress. GOP leaders vulnerable to the lure of Russian money grows exponentially when we look at the party’s most dominant single-issue lobbyist group — the NRA — and its suspicious ties to the Kremlin. The NRA is the most powerful single-issue lobby with Republican Congress members, outspending the opposition 40 to 1. CNN reports that 307 of the 535 current members of Congress have benefited from direct contributions or advertising support from the NRA. Even more striking — the NRA’s donations to Republicans in Congress during the 2016 election cycle increased by $100 million, according to The Center for Responsive Politics. McClatchy states that the FBI is currently investigating Torshin’s Kremlin ties and his funneling of money into the NRA to help Trump win. We believe it is likely that the NRA also helped the Republicans in Congress win. Senator Ron Wyden, who serves on both the Intelligence Committee and the Finance Committee, told NYT ’s Michelle Goldberg he believes it’s possible the “NRA is getting subverted as a Russian asset.” Rep. Adam Schiff told Goldberg that the HIC’s abrupt closing of their Russia investigation and refusal to interview Marina Butina, Torshin’s arrested partner, is because they “didn’t want to know” if there was a back channel between the NRA and Russia. Goldberg writes that just hours after Butina was arrested, the Treasury Department created a new rule allowing the NRA to avoid having to report their biggest donors to the IRS; Widen observed that this “grotesque move” will make it “easier for Russian dark money to flow into American politics,” including GOP members in Congress. Goldberg posits, based upon her research, that the Republicans may be “covering” up the relationship between the NRA and Russia on behalf of themselves, not just for Trump. When examined collectively, these data points establish a strong narrative — many powerful, Republican leaders in Congress are behaving in an incongruous fashion, in relationship to Trump and Russia, inconsistent with a purely partisan policy agenda. If they wanted to simply lower taxes for the rich, block immigration, overturn Roe v. Wade, and advance their authoritarian agenda without compromising their reputations and electability in the future, then impeachment and a Mike Pence administration makes the most sense. Although financial ties to the Kremlin appear to be a strong incentive for cooperation, the Congress member’s conduct appears to be motivated by more than just money. Clearly, these powerful GOP leaders do not want to know about Russia’s interference in 2016, and they do not appear to care if Russia meddles in future elections. And alarmingly, they are willing to protect Trump, even though their association with him will undermine their future political careers, and in spite of the fact that he is a danger to our nation. If the Republicans were to take Wired’s advice and look back at “potential scandals” during the ten-year email period, there is a wide range of material they might find. On one end of the “scandal” spectrum, it is possible that the Republican emails could contain sexist or racist content that makes Donald Trump’s tweet storms look tame in comparison. It is also rational to consider that the hacked Republican emails might reveal sexual conduct involving Congress members that is likely to offend the religious right. Or perhaps the emails contain details regarding Republicans having non-consensual or predatory “relationships” with subordinates that would energize the “me too” movement on the left. It is also conceivable that the RNC emails could include a history of GOP leaders covering-up scandalous conduct committed by other Congress members that is even more egregious in nature. Paul Ryan’s words, “what’s said in the family stays in the family,” come to mind. There is a documented history of Republican leaders covering up scandalous behavior that overlaps with the ten-year span of hacked RNC emails. Speaker of the House, Dennis Hastert, was in office from 1999 to 2007. The House Committee on Ethics found Hastert to have been “willfully ignorant” regarding former Representative Mark Foley’s predatory behavior towards under-aged male pages and discovered that Hastert coordinated with other Republican leaders to look the other way for years, while Hastert was in office. If former CIA agent, Philip Giraldi, is correct in his intelligence-based assertions, then it is reasonable to consider the possibility that ten-year’s worth of Russian-hacked RNC emails contain the coordinates for where some of these scandal-ridden bodies are buried. It is possible that some of the hacked Republican emails include discussions between current Congress members and Hastert regarding these cover-ups, as well as the blackmail game Hastert was playing with Republican leaders who may have been guilty of other related crimes or at least, embarrassing behavior. It is also possible that these hacked RNC emails include newer scandals and cover-up that do not involve Hastert. It would be extremely naïve to assume that hiding compromised behavior and playing the leverage game with fellow Congress members is limited to the period when Hastert was in office or to just his scandals. It is also rational to, at least, consider the possibility that Putin may have accessed some of these “buried bodies” through the RNC emails and that he could be using this material to threaten certain members of Congress today. Putin could never keep up with the United States’ missile program in the ‘80s, but he knew there was a game where he could win. The former FSB head recognized America’s greatest vulnerability in its unprotected infrastructure, and thanks to Russia’s cyber sophistication and coercion prowess, Putin knew just where to strike the U.S., crippling us on a post-modern battlefield. Not only did he defeat the Democrats during the 2016 election, but he may be currently threatening the “winners” of the election, attempting to elicit their voluntary or involuntary cooperation. (This arrangement for some Republican leaders may be explicit, but for others implicit, like the unspoken understanding some people have with violent gangs that control their neighborhood — to stay away from certain places at certain time, to look the other way and never talk to the police.) And while Putin has achieved the ultimate Soviet goal of controlling an American president — a “useful idiot” — he may also have achieved something far more dangerous: If key Republican Congress members are hiding their Kremlin-linked finances or are being threatened for some other reason, making it difficult to fulfill their Constitutional duty to provide oversight of the executive branch, then Putin has made a mockery of the democratic system we cherish and has set us on a collision course with authoritarianism.